Opening reception Saturday, February 9th from 2–4 pm. Gallery hours thereafter Wednesday–Friday 12-6, Saturday–Sunday 11-5, and by appointment. Image: Eli Carmona, I can see the light, from the series “.~This is home now” (2018). Image courtesy of the artist. … move or be moved by some ‘thing’ rather than oneself. Critical Distance is pleased to present … move or be moved by some thing rather than oneself., an exhibition that considers curating and choreography as materials and subjects. Bringing together the work of Guillaume Adjutor Provost, Adam Basanta, Adrienne Crossman, and Nadège Grebmeier Forget, the exhibition is curated by Florence-Agathe Dubé-Moreau and Maude Johnson. The title, taken from a quote by choreographer Yvonne Rainer, echoes the curators’ desire to question the potentialities of artworks as well as presentation contexts from the position of transdisciplinary instability. Guillaume Adjutor Provost is a Montréal-based artist. His practice is situated at the borders of visual arts, curating, and literature through hybrid works. He holds a Ph.D. in Arts Studies and Practices from UQAM and is the 2016-18 recipient of the Claudine and Stephen Bronfman Fellowship in Contemporary Art. His solo exhibition have been presented in various venues, such as Centre CLARK (Montréal, 2016), Diagonale (Montréal, 2017), and Bikini (Lyon, 2018). Adam Basanta is a Montréal-based artist, composer, and performer of experimental music. His sculptures and installations reveal the conceptual and sensory dimensions of sound in the exhibition space by modifying the usual relationship of the visitors to it. His recent projects have been presented in Europe, United States, and Canada. He is long-listed for the 2018 Sobey Art Award. Adrienne Crossman is based in Windsor. Their approach as an artist and curator questions the normativity of representation and the boundaries of the physical or virtual exhibition environment. They examine the potentialities of a queer sensibility through digital media and popular culture. Their recent projects have been shown in Toronto, Windsor, Carlisle (UK), and Montréal, as well as in The Wrong New Digital Art Biennale. Nadège Grebmeier Forget is a Montréal-based artist. She employs choreographic and curatorial strategies to complicate access to her performing body in live, video, or installation works. Recent exhibitions and performances have been presented in various venues, such as VU PHOTO (Québec, 2016), She Works Flexible—Flex Space (Houston, 2016), and OPTICA (Montréal, 2017). Florence-Agathe Dubé-Moreau is a Montréal-based writer and curator. MA candidate in Art History at UQAM, her research questions the effects of exhibition reenactment in contemporary art. She was the Assistant Curator for the Canadian Pavilion at the 56th Venice Biennale (2015), co-editor of the book Questionner l’avenir. Réflexions sur la réactualisation de la Biennale de Montréal (2015), and curator of the exhibition do it Montréal at Galerie de l’UQAM (2016). Maude Johnson is a Montréal-based writer and curator. She holds a MA in Art History from Concordia University. She is interested in the relationship between bodies, times, and spaces. 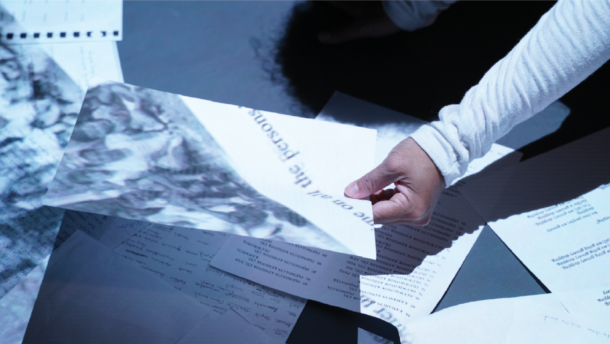 Her research explores performative and curatorial practices, while probing methodologies, mechanisms, and languages within interdisciplinary practices. Her recent projects have been presented in the SIGHTINGS space of the Leonard & Bina Ellen Art Gallery (Montréal, 2016) and at Artexte (Montréal, 2018). image: Nadège Grebmeier Forget, Rendering on View (Betty Rowland meets Angela Aames), 2017. Performed on May 27, 2017, as part of the installation Walls of Wind: The mirroring and rendering which was created in the context of the group exhibition I’ve Only Known My Own curated by Nicole Burisch and presented from April 21 to June 10, 2017, at OPTICA, Montréal. Photo by Paul Litherland. Fermenting Feminism is a multidisciplinary project that takes different forms: beginning as a publication in collaboration with Lauren Fournier and the Laboratory for Aesthetics and Ecology, it has evolved into site-specific exhibitions, installations, and screenings in Toronto, Berlin, Copenhagen, and Kansas City. This exhibition at Critical Distance marks the Canadian launch of this project. The site-specific evolution of Fermenting Feminism instantiates the context-specificity of microbes and fungi, of fermenting bodies, and of feminisms. Please join us for an opening reception with the curator on Thursday, September 14th from 6–9 pm. Refreshments will be served and all are welcome. Our reception is the same night as Koffler Gallery’s fall exhibition opening downstairs — two for one at Artscape Youngplace this evening! Gallery hours are Friday–Sunday 12–5 pm and by appointment through November 26th. Office hours by appointment only. Critical Distance is a not-for-profit initiative and space devoted to the support and advancement of curatorial practice in Toronto, Canada, and beyond. Part gallery and publisher, part professional association and community, CDCC is an open platform for diverse curatorial practices and perspectives, and a forum for ideas on curating and exhibition-making as ways to engage and inform audiences from all walks of life. For more info, visit our website or social media pages, linked above. Gallery hours are Friday–Sunday 12–5 pm and by appointment through November 26th. Critical Distance is pleased to open our landmark 5th year of programming with Fermenting Feminism, curated by Lauren Fournier and featuring Sharlene Bamboat, Hazel Meyer, Leila Nadir and Cary Peppermint, Sarah Nasby, Kayla Polan, Walter Scott, and Agustine Zegers. Kombucha, guts, bacteria, vessels, vitalism, effervescence, degradation, and decay. 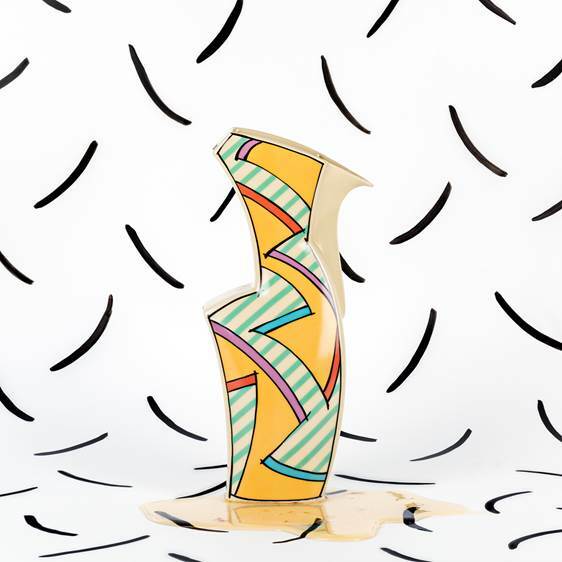 Fermenting Feminism brings together artists whose work fleshes out the intersections between fermentation and intersectional feminisms. As the process of microbial transformation, fermentation becomes both a metaphor and material practice through which to approach feminist practices in the contemporary. Is feminism a relic of the past, something that has soured? Or is feminism still a vital imperative? This exhibition positions fermentation as a vital and viable space to re-conceive feminisms’s pasts, presents, and futures. Working across art, science, performance, and design, the works in Fermenting Feminism make space for multidisciplinary experimentation and conceptual play. Fermentation symbolizes bioavailability and accessibility, preservation and transformation, interspecies symbiosis, sustainability and futurity, harm reduction and care. Spanning the speculative and the literal, the embodied and the ephemeral, the works in this exhibition revisit questions of importance to feminists—consumption, colonialism, hygiene, wellness, agency, ritual, sexuality, transformation, and tradition—through the theory and practice of fermentation. Sharlene Bamboat works predominantly in film, video and installation. 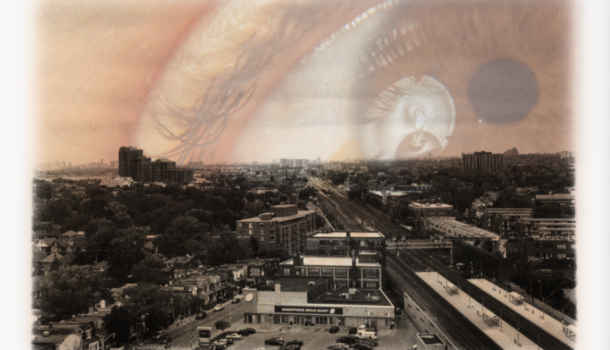 Based in Toronto and Pittsburgh, she has exhibited at galleries and festivals internationally, including Les Complices* (Zurich), the Images Festival (Toronto), The Art Gallery of Windsor (Ontario), and Vasakh Film Festival (Lahore). Sarah Nasby works primarily in sculpture and drawing. She holds an MFA from NSCAD University and a BA from the University of Guelph. Selected exhibition venues include Mercer Union, DNA Artspace (London), and Dunlop Art Gallery (Regina). Sarah acknowledges the support of the Toronto Arts Council for her work in this exhibition. Hazel Meyer works with installation, performance, and textiles to investigate relationships between sport, sexuality, feminism, and material culture. Drawing on archival research, she bring various troublemakers—lesbians-feminists, gender outlaws, leather-dykes—into the performative space of athletics. Leila Nadir and Cary Peppermint investigate food, ecology, media, and memory, creating social sculptures that facilitate recovery from a cultural memory disorder they call “industrial amnesia.” Nadir is an Afghan-American critic, scholar, artist, and lecturer in Sustainability and Environmental Humanities; Peppermint is an Associate Professor in the department of Art and Art History—both at University of Rochester. 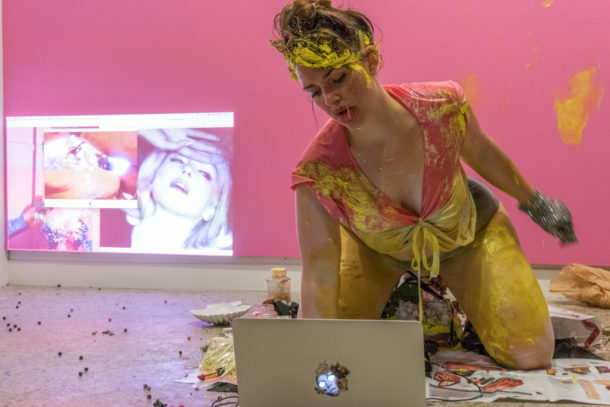 Kayla Polan is a multidisciplinary artist whose practice melds feminism and popular culture to explore sexuality, fetishism, domesticity, queer identity, autobiography, and consumer culture. She holds a BFA in Drawing & Painting from OCADU and her work has been exhibited in group exhibitions in Canada and Europe. Walter Scott is a Kahnawake-born artist currently based in Montreal and Toronto. His practice includes writing, video, performance and sculpture, through which he explores questions of representation, cultural production, popular culture and narrative construction. His work has been exhibited in Japan, North America, and Europe. Exhibition curator Lauren Fournier (Regina, Saskatchewan) is a writer, curator, artist, and PhD candidate currently based in Toronto. In addition to her art and curatorial practices, she has worked as a frontline mental health and harm reduction worker. She has exhibited her work in galleries, artist-run centres, and screenings across Canada and in Berlin, Athens, and Houston. Her writing has been published in Canadian Art, Magenta, Kapsula, The Journal of Comparative Media Arts, Milkweed, Canadian Journal of Woman Studies, and West Coast Line. Recent curatorial projects include The Sustenance Rite at the Blackwood Gallery and Out of Repetition, Difference at Zalucky Contemporary. Critical Distance is pleased to announce our 2017 Summer Sessions exhibition, Moving Home: The Art and Embodiment of Transience Emerging from Canada’s Child Welfare System. Presented by York University Human Geography master’s candidate Amelia Merhar, this project is the second to be hosted as part of our Summer Sessions initiative, a program through which we support emerging curators and artists by providing free space, mentorship, and installation support for their thesis exhibitions. How is transience embodied, carried, and performed? How do repeated moves of homes, schools, and communities linger in the body, from the past to the present? What sort of people is the child welfare system inadvertently creating through so many foster and group home placements? Beyond pathologizing transience, what can we learn from the young and hyper-mobile? Moving Home explores the embodiment of transience as experienced by young people who grew up in the Canadian child welfare system. It is part of Human Geography Master’s thesis research at York University coordinated by Amelia Merhar, inspired by her lived experience in care. Using arts-based, participatory, and Indigenous research methods, Merhar worked with 15 co-researcher artists in their chosen mediums to explore and compare urban/suburban and Northern/rural experiences at the partner youth art organizations SKETCH Working Arts in Toronto and Splintered Craft in Whitehorse. 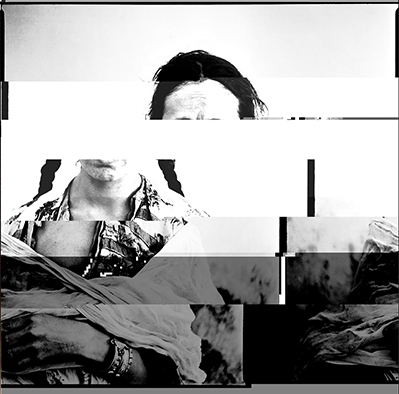 Artistic explorations of the theme of embodied transience include works of photography, textiles, silk-screening, collage, mixed media, dance, performance, music, spoken word, painting, text, jewelry, dream catchers, and installation. The first Call to Action the Truth and Reconciliation Commission is to reduce the number of Indigenous youth in care in Canada. There are more Indigenous youth in care today than were in Residential Schools. In Toronto, research has shown that Black youth are disproportionately apprehended and stay longer in the system than their non-Black peers (although through recent efforts these numbers are declining). Art alone can’t solve ongoing violence and colonialism; however it is a way to transgress and re-imagine present social boundaries. The goal of arts-based research is to provoke conversations instead of static research conclusions, and we invite you to enter the conversation here with former youth in care and their art. The show opening is preceded by a research presentation at the Ontario Provincial Advocate for Children and Youth Office from 1-3 pm and the launch of the project zine, TL;DR, a thesis in a zine. All are welcome. This project was awarded the Social Sciences and Humanities Research Council of Canada–Master’s Scholarship –Award to Honour Nelson Mandela in 2016, recognizing its commitment to youth participation. Funding for co-researcher artist honoraria and art supplies provided by Ontario Provincial Advocate for Children and Youth, and the Yukon Child and Youth Advocate. Northern travel and living expenses supported by Northern Scientific Training Fund–Government of Canada.